I typically build everything out of 3/4" birch ply. Please email, post or PM any questions! Not really looking at the moment, but what would a typical cost be? Say for one of those panels pictured above? I am also curious. Looking to rebuild my CP soon but haven't found the time to mess around with laying it out in a cad program yet... it's been probably 15 years since I really did any cad so it's a relearning curve just to make anything. can you do metal also? also is it the CP tops only or do you do the whole cp? Those panels were roughly $60 each. Matching Plexi was about $40. Unfortunately no. I don't have the equipment for sheetmetal work. I have a mill and lathe and am able to do some custom metal working, but I still have to get all of my metalworking tools unpacked and organized. I can do the whole panel, hinges and all. I don't currently have any bartop plans, but I can make anything i can draw. 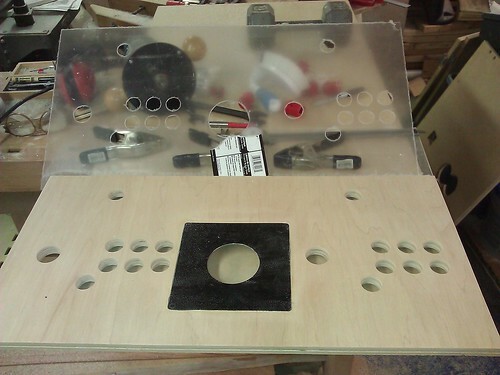 guessing you can do custom layout and cut the panel for for japanese buttons and sticks? I may need one of these from you. will PM when I am ready. 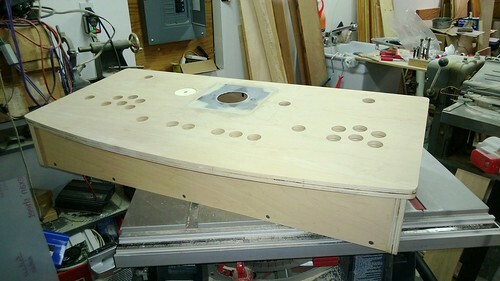 planning a new 1player cabinet. 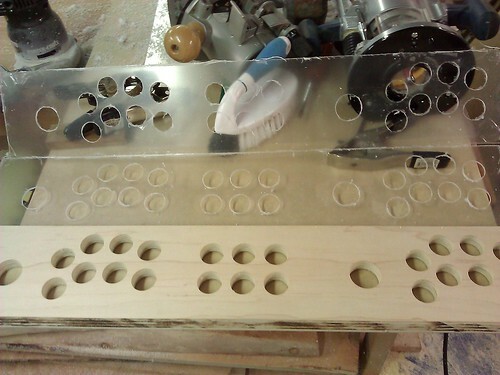 I can always pick up a new bit if the fly cutter can't make the hole, but i have a wide variety of forstner bits as it is, and holes for buttons usually have kind of a wide tolerance with the flanges on them. Bit of trivia: Nick Offerman is an expert woodworker and he's got one hell of a work shop. I could use your service. Ballpark shipping costs assuming UPS ground or whatever you've used? 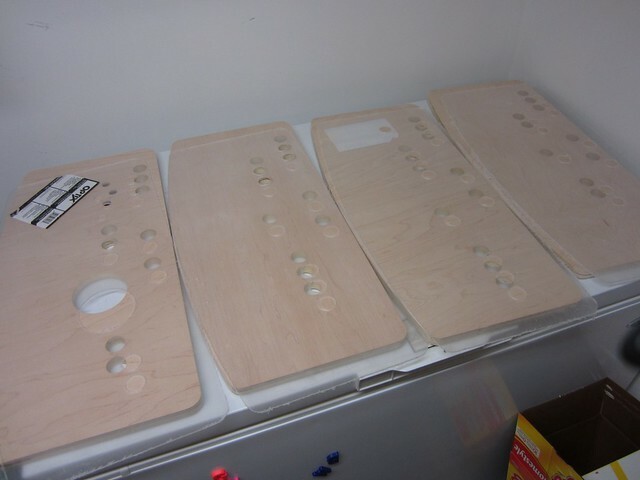 I shipped 4 control panels and plexi tops from NY to AZ, 38# crated. That was $54. It may be a different rate for a single panel, especially if you have to use a different service. True. Size, weight and carrier thorw a bunch of variables in there. That's why i don't typically quote shipping until the item is ready to be shipped. I can only give a ballpark figure. You're in NY. Where exactly? I threw in an extra plexi on that second one to offset some delays i had on my end. Hopefully it'll come in handy down the road. HA!. I wish it were mine. I worked with yaksplat and ordered an oversize / designed panel and it turned out great! I would recommend his services! It shipped to me in 1 day! Yaksplat, do you have layouts for Mortal Kombat 1/2 (5 button) and Mortal Kombat 3/4 (6 button)? Also, where outside of Buffalo are you? I'm between Rochester and Syracuse so pickup would be desirable. 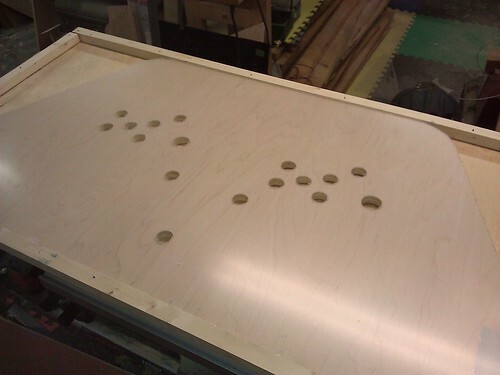 Here's a 5 button MK panel and plexi crated for shipping. I can create any button layout you want though. I'm about 10 miles east of buffalo. But it may cost you more to drive than shipping. The panel in this post (48" x 24") only cost $15.36 to ship to Michigan. Hey yaksplat you got my e-mail of the art right? Can I order an MK2 control panel from you ? To be fair, it is a holiday weekend. Give him a few days. I think I have replies out to everyone now. If you were missed please send another email. It's bad when you get 600 emails over the course of a few days and have to sift through them all looking for anything important. Are you still doing custom panels? I had a couple of emails but havent heard anything in a while. 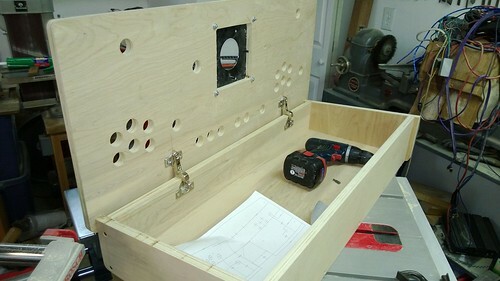 A couple pics of a recently completed panel with a recessed trackball mount and attached box. And now that I look at those pics, wow, my shop is a disaster. if you're boxerman, you're next in the queue. If not, send me another email. All quotes are out. If you're still waiting on one, please let me know. Gmail decided that a bunch of quote requests were all spam, so hopefully I've got everyone covered now. can't PM you as my account here is new- I'm interested in getting a custom bartop design fabbed- how else can I contact you? I'm new so I can't PM yet. I am interested in a control panel with box. How else can I message you? Thanks.